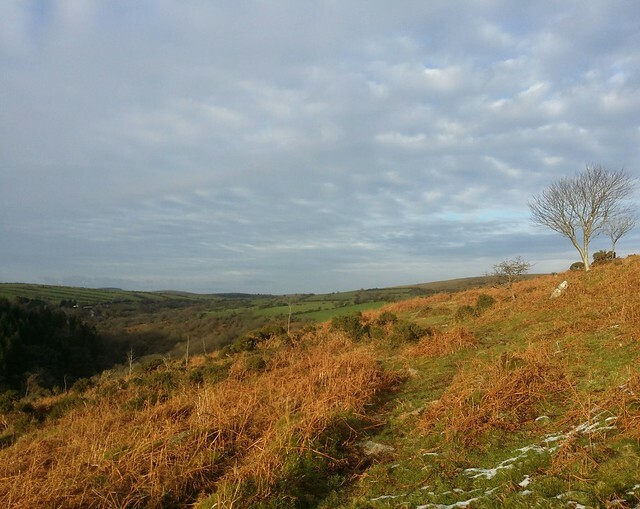 I first became aware there was something amiss when Phil Sorrell mentioned that my photo of Blacka Tor (East Dart) in my post "Dartmoor: The Tors and Rocks around Bellever" didn't look like the tor he had seen on Twitter. He sent me the tweet and it bared no resemblance to where I had visited. 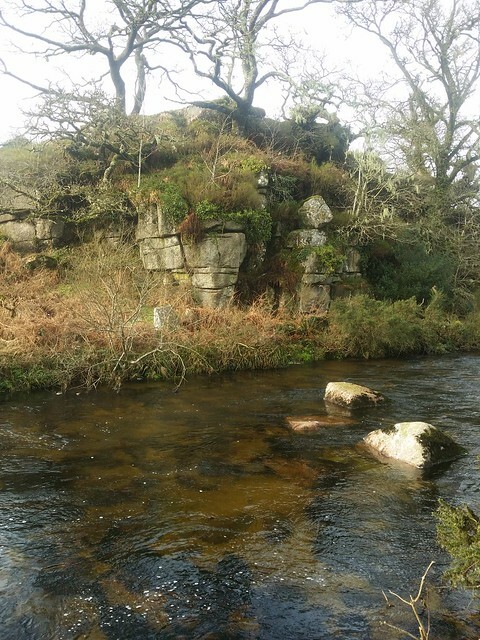 I did some digging, or Googling, and I found further images of "Blackator Rocks"; an impressive outcrop perched on the bank of the East Dart. Far more imposing than the short rounded granite, partially hidden in undergrowth, further up the hill. Soon after, Dartefacts Dartmoor Artefacts concurred with Phil. 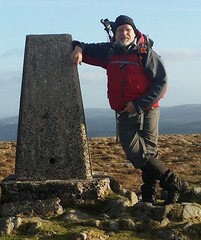 And yet, the tor I had visited further up the hill was at the grid ref where Ken Ringwood had said it would be in his book, and Dartefacts confirmed that his photo matched. 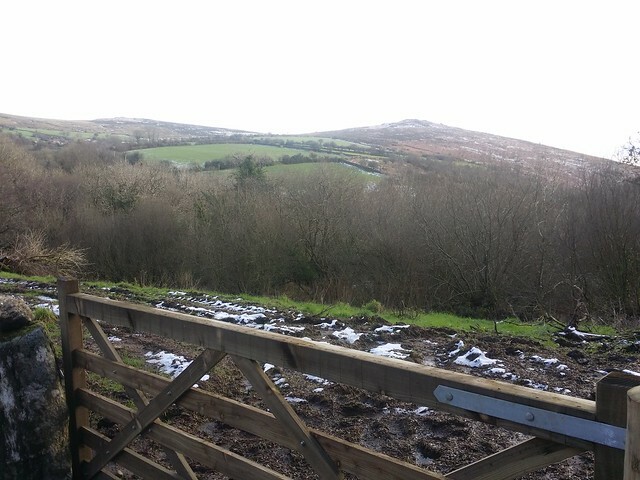 I considered that maybe we had two tors here; Blacka Tor (East Dart) and Blackator Rocks. 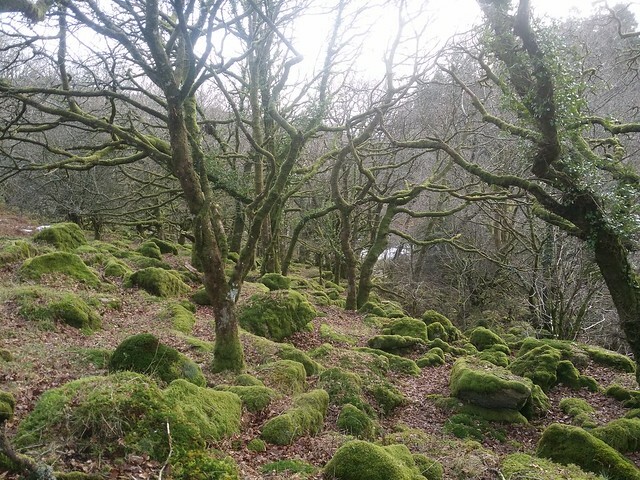 When I got home to Devon that evening, I consulted Ken's book "Dartmoor Tors and Rocks; "Aka Blackator, Blackator Rocks. 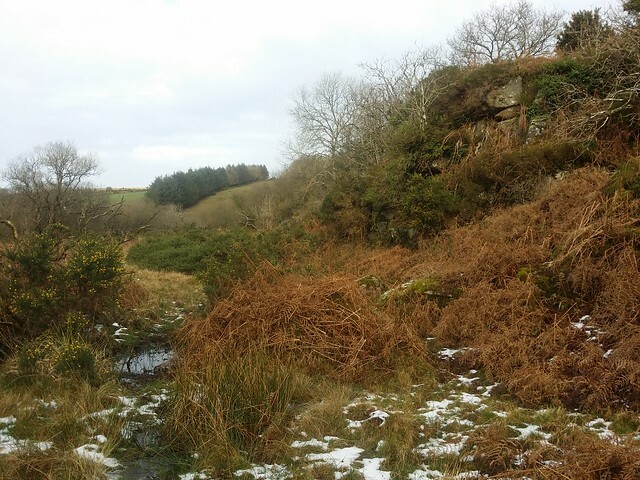 Pictured is the highest outcrop on the W hillside above the East Dart River. This is a very small granite tor in two parts with scattered clitter. There are walls to the W and Little Newtake Plantation to the S. Babeny hamlet is across the river." 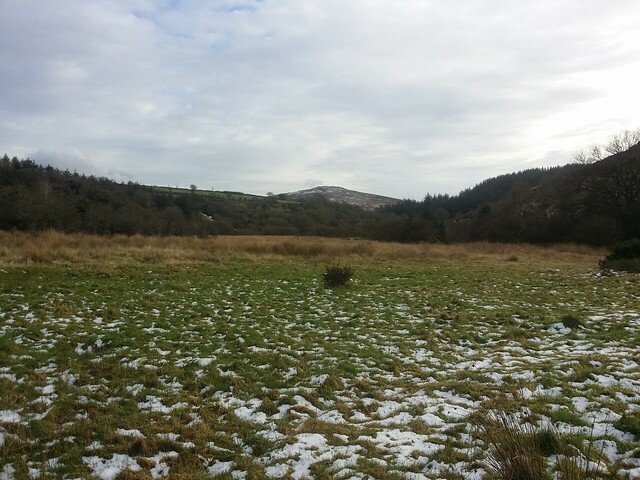 Blacka Tor (East Dart) at an angle similar to that in the book. Now, Ken said this was the highest outcrop so could he be lumping it in with the one at the bottom? If he was, it wouldn't make it "small" as the lower set was over one hundred and fifty metres or more away. 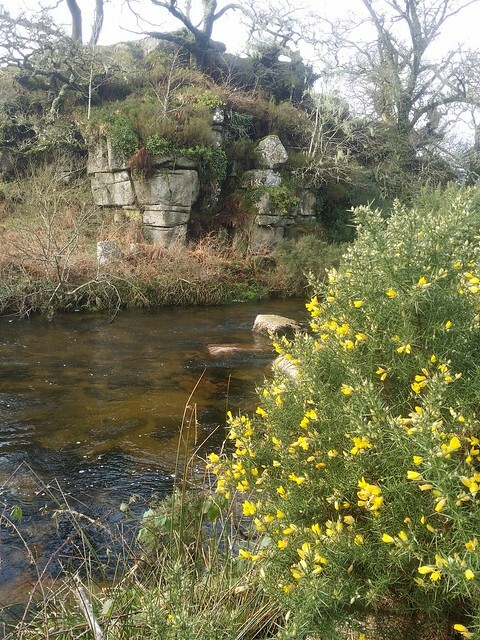 All very interesting but it was particularly annoying that I hadn't wandered down to the river the other week, where I would have certainly discovered the more widely accepted outcrop! Only one thing for it! 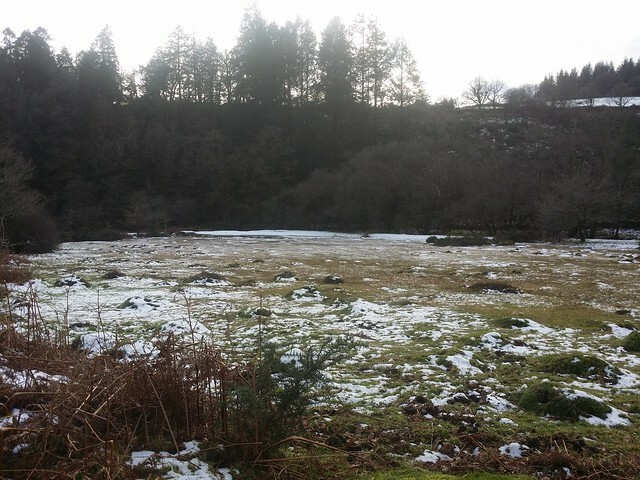 It was near midday when I set off from Dartmeet. Despite the lure of the first settled snow on higher ground, the senseless verge parking I witnessed on my drive across the moor vindicated my decision to give it a miss. I was pleased to leave the masses enjoying themselves, and be assured of some solitude where I was heading. Perhaps, if I had ventured out earlier, I might have enjoyed harder ground along the bank of the East Dart. 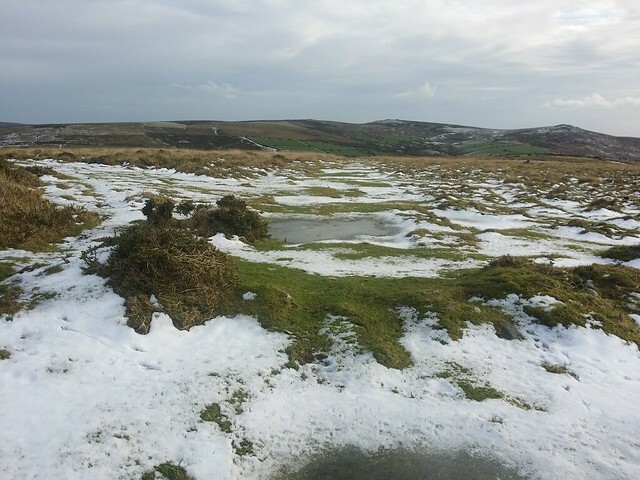 Instead, the ground was half defrosted and I was soon unhooking my idle walking poles from my rucksack to steady myself. 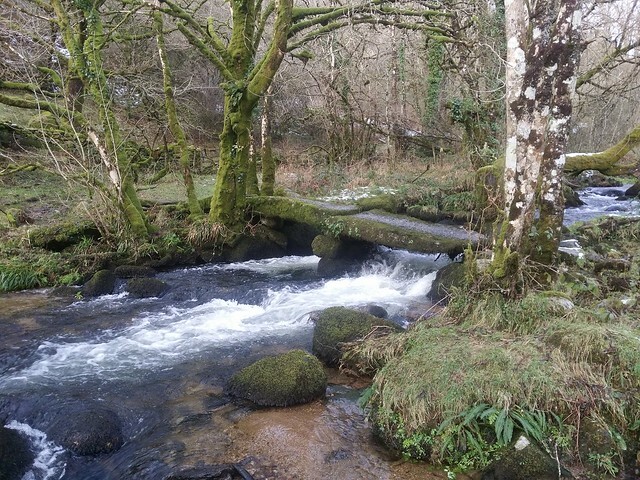 I made it to the ancient forest boundary mark where the Walla Brook flows into the East Dart, with its nearby stepping stones crossing to Brimpt's Northern Woods. 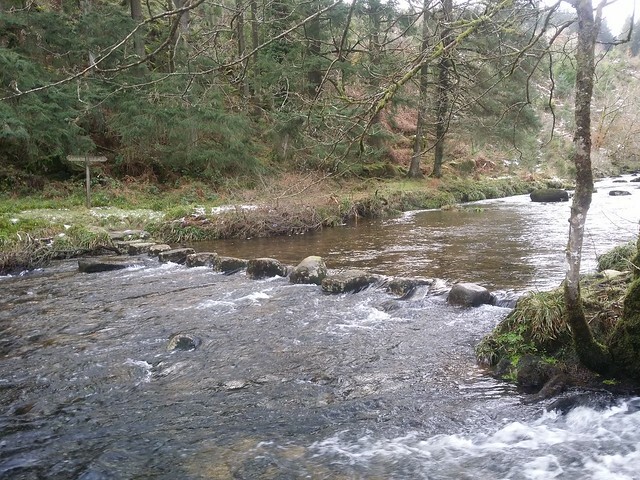 I only needed to be across the brook, not the river, but to achieve either you still need to head further up to a clapper bridge, before returning down the other side to the East Dart. 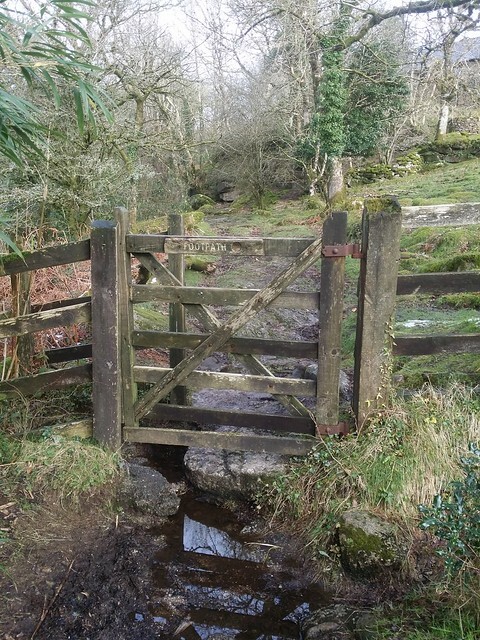 I thought my expedition was almost scuppered when I reached a stile into some access land. The wooden structure was icy and I struggled to get any grip. It was an ungainly manoeuvre, but I managed it unscathed, then began to move along the river up to the bend where Blackator Rocks sits. 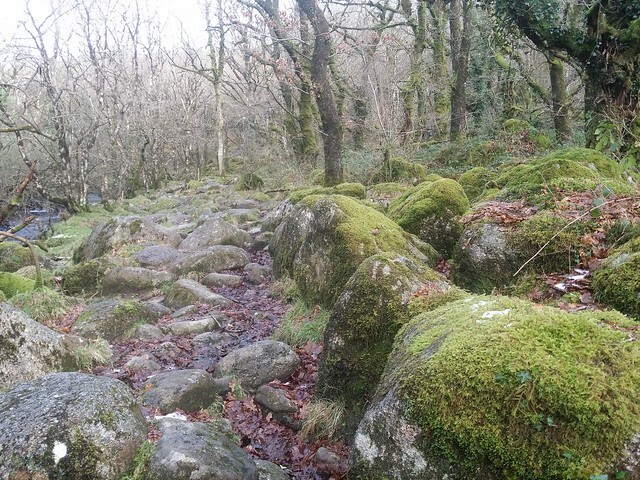 This section had its challenges through boulders and sodden ground. 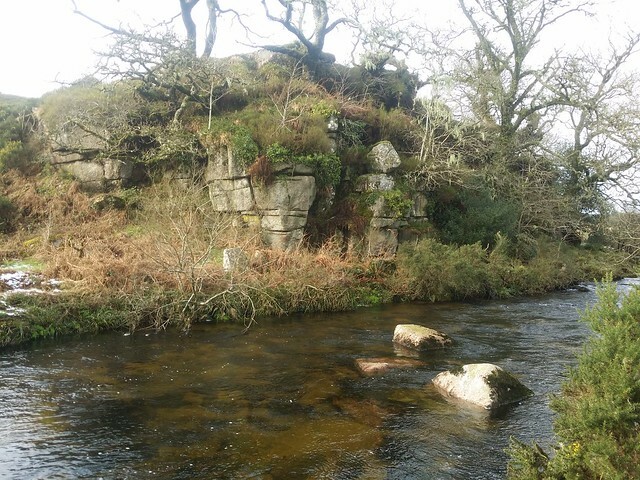 I also noticed that there were plenty of hidden outcrops here, named Stone Park Tor. I rounded the bend, slowly due to the mire beneath me, approaching a dark mass on the other bank. I had reached Blackator Rocks. Some may question why I had chosen to approach the outcrop from the east, when it sat on the west bank. My reasoning was that I wanted a decent vantage point to snap a photo, as from the correct side, this can't be attained. I have to admit, this is more deserving of recognition than the tor sat above it, to the west. However, I wouldn't dismiss the other. You could also take the point of view why would the set by the river be labelled Blackator "Rocks" if there wasn't already a tor called "Blacka" Tor in the vicinity? Unlikely, I grant you, and we'll never know the origin of the names. 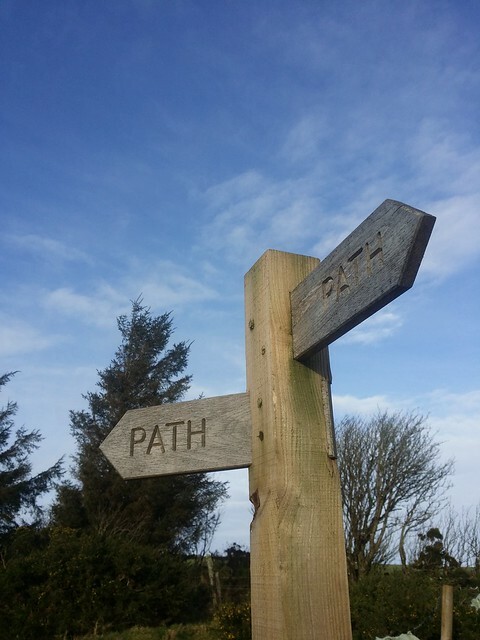 Neither are documented on any OS map I can find, but it is worth considering that both are recognised as separate, if only for the purposes of Social Hiking Tor and Rock Bagging. Of course, if you are reading this and you can shed light on this particular mystery, please leave a comment. With no option to ford the river, I continued north on a difficult trek through the worst of the mire. This section widened and had felt the warmth of the sun, despite there being some patches of snow. 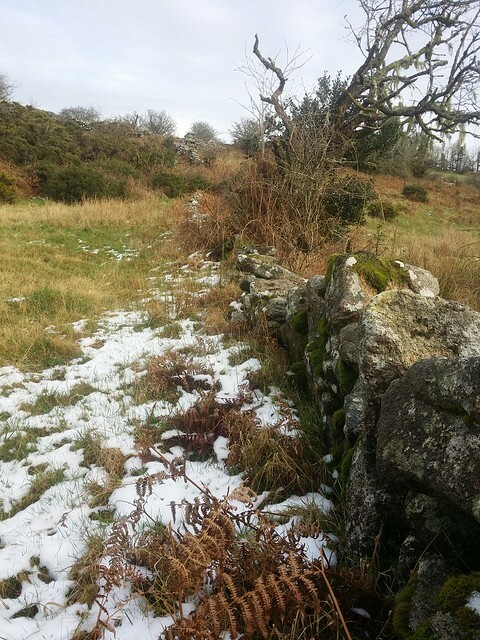 I reached a second wall, my map indicating this was where it was time to turn and follow it part way up the Riddon Ridge. After some meandering through clumps of long grass, I came across a track, and made for the summit of the hill. On the way, I spotted a cairn with a bound stone that had an inscription. At first I thought it said "RIP", but on closer inspection realised it said "RHR". 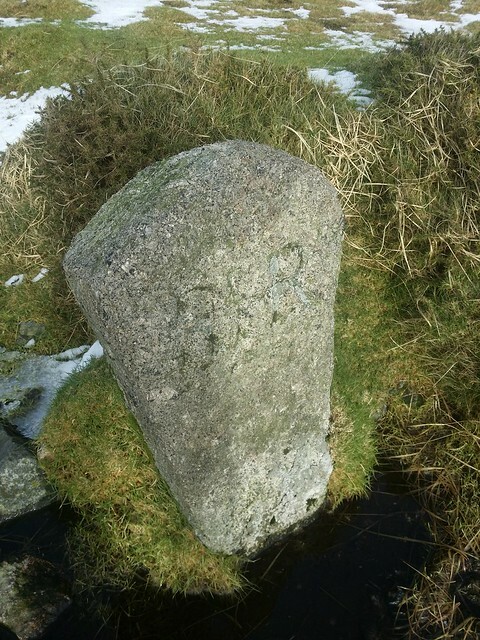 The ever reliable Dartefacts later told me that these were the initials of a Robert Henry Roberts. 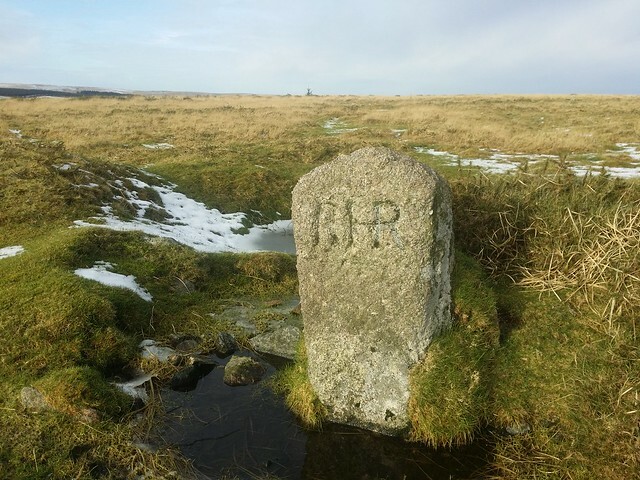 Further investigation (which usually just needs to be a click to "Legendary Dartmoor") tells me that there are nine other similar bound stones and it is thought that they marked the areas where the Duchy of Cornwall granted permission to cut peat. I trod a little further to the top of the hill. Still some snow lingering, despite the sun. 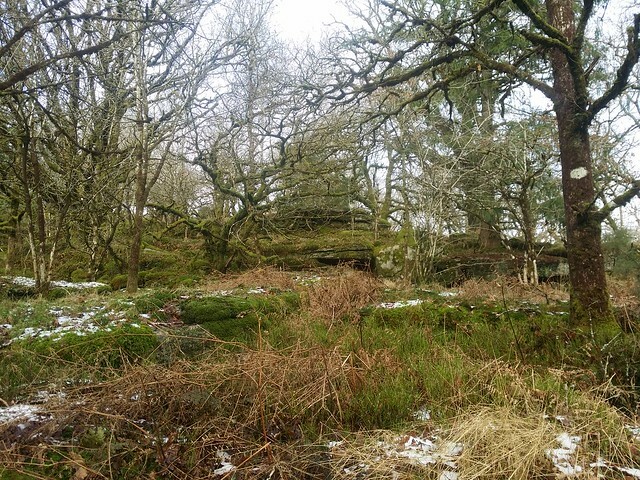 I am reliably informed that Riddon Ridge has plenty to explore in the way of archaeology, so will merit another visit. I turned south to find the bridleway to Babeny, which proved no problem. 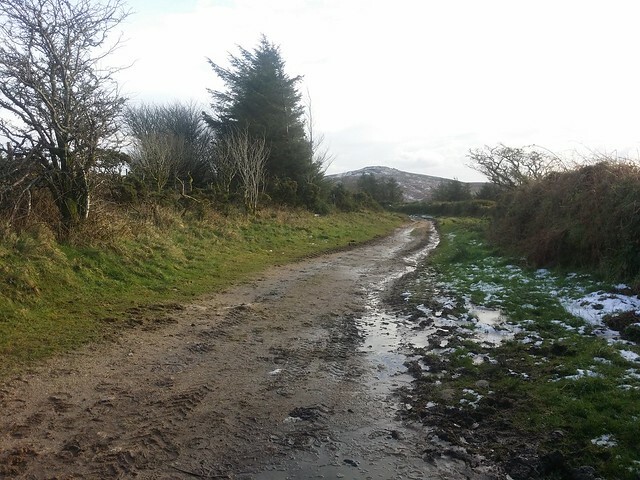 The ground was good, and when I reached the gate, the track became a lane down to the hamlet. 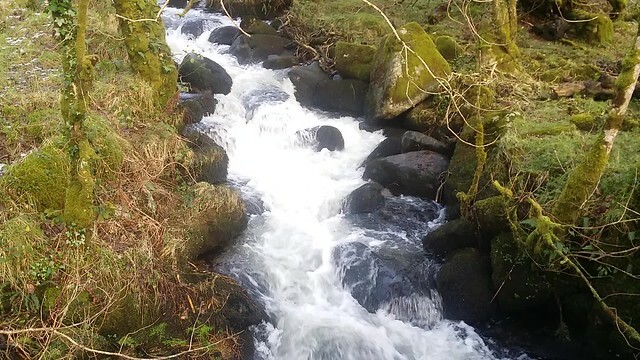 I stopped at the bridge that crossed the Walla Brook, to enjoy the water tumbling on its journey to the East Dart, then a little further, at a bench to feast on a couple of boiled eggs and a flask of hot Ribena. 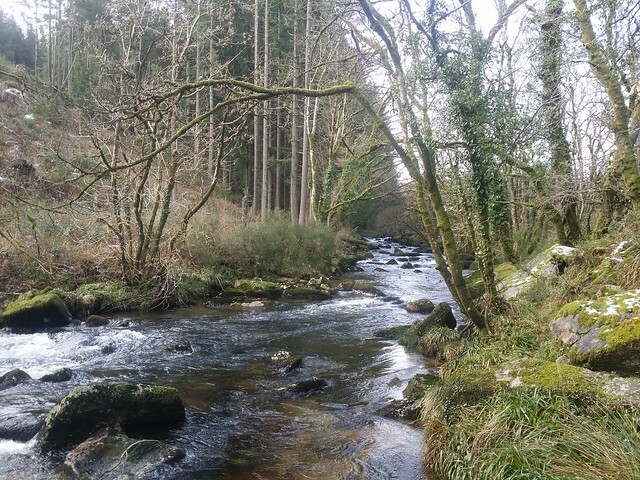 What was left was to retrace the forest boundary to Dartmeet, which I wasn't particularly looking forward to given the rising temperature meant the route would be worse than my earlier traverse. As I started, I noticed some horse riders take a higher route, and I decided to ascend a little. 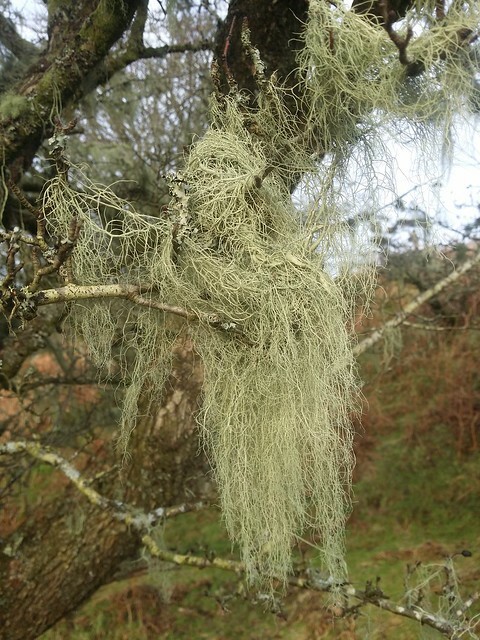 I found myself in some fairytale woodland; moss carpeting clitter, and oaks adorned in old man's beard. I just kept going, gradually ascending, until I came to a path churned by the hoof. It was a sticky affair, but easier than rock hopping in the woods. I eventually reached the bridleway marked on the map, walking out into the warming rays of the sun, high above the East Dart valley, to my right. 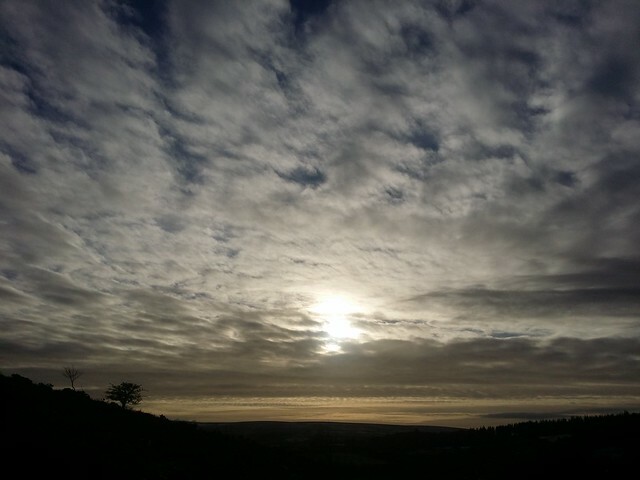 Some twenty minutes later, I had descended down to Badgers Holt and the car park. Quite a short walk; eight and a half kilometres, but still three and a half hours with all the negotiating of bogs and rocks.